The High Point tungsten wedding band is as powerful as it is bold. This style of tungsten wedding bands feature a beveled profile with strong lines that run along the edges of the ring. The top of the ring has a high polish finish with an elegant and round blue diamond solitaire set into the middle of the ring with a white gold bezel. 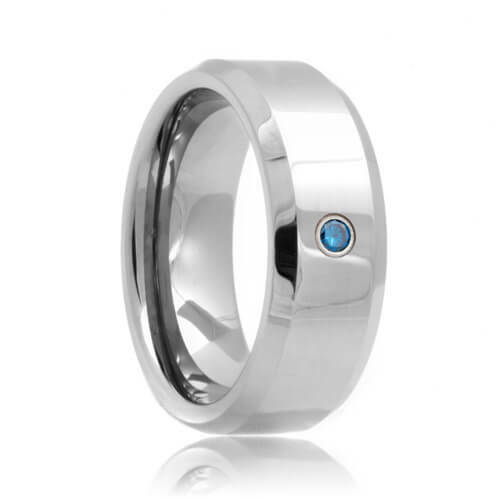 This tungsten band is guaranteed for life and will continue to look new for as long as you will wear it. This style is made to order so please allow 5 - 10 business days to manufacture and ship. Free Lifetime Warranty and Lifetime Sizing; pay no restocking fees or deductibles! With no knowledge of tungstun wedding bands, I went on the internet looking for the best wedding band within my budget. I looked at so many websites and visited so many stores in town. I talked to so many sales people and took a look at what they could sell me. Then I ran across Tungstun Rings & Co. After analyzing all of the options I had available, I concluded they had the best price and quality. I am confident I made the right decision to go with Tungstun Rings & Co and for anyone else looking for a tungstun wedding ring, I encourage you to make the right choice too with Tungstun Rings & Co.